April showers might bring May flowers, but they also bring the arrival of troublesome plants such as poison ivy and poison oak that can cause mild to severe allergic reactions. The signature leaves of three of the poison ivy plant carry an oil called urushiol that can be an irritant if touched, broken or burned. Poison ivy's less-common cousin, poison oak, can be identified by leaves that look like hairy oak fronds. While some people are not sensitive to the urushiol oil, others develop a red, itchy or painful rash, swelling or blisters where the irritant comes in contact with the skin. The reaction doesn't happen right away though. It typically takes at least 24 hours to develop, happening faster each time you are exposed. 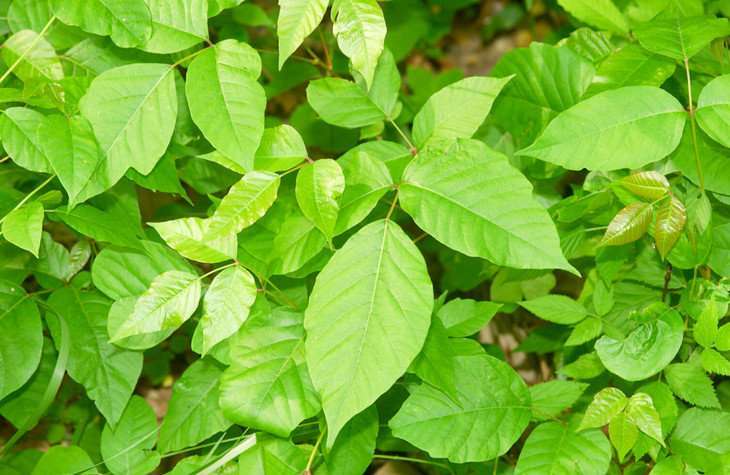 Dr. Claire Hollins, a dermatologist at Penn State Health Milton S. Hershey Medical Center, said what many people don't know is that poison ivy and poison oak can also become airborne and can be spread by burning piles of wood or brush that includes the leaves. "Sometimes people wake up days later and their eyes are puffy and swelled up so much that they can't see but they don't know why," she said. Hollins has also heard of cases where people chop firewood in the summer and the urushiol oil from poison ivy on it is reactivated by burning that wood in the winter months. Black dot dermatitis—a condition where black dots develop on parts of the skin sprinkled with the oil from the poison ivy plant—is less common, but usually comes from whacking weeds, brush or vines that include the plant. Hollins said the best prevention is to avoid contact with poison ivy altogether by covering up and wearing long pants, socks and gardening gloves. She recommends that anyone who suspects they have come into contact with a poisonous plant wash their hands immediately with warm, soapy water and dry them on a disposable towel, rather than a cloth towel, to avoid spreading the harmful oils. If irritation does develop, it can be treated with over-the-counter hydrocortisone ointments. More serious cases may require a course of oral prednisone and stronger topical steroids from a dermatologist or primary care provider. Hollins said poison ivy is not typically passed from one person to another unless the oil is still present on clothing or skin. It is also not spread by scratching areas that itch, as the urushiol is not present in blister fluid. Hollins said Hershey Medical Center's Department of Dermatology is conducting research to look for a vaccine for poison ivy, and researchers are currently testing an urushiol patch to see how effective it is.